Adobe was a bit busy on Wednesday, releasing new versions of its Creative Cloud suite, new hardware, and three new iOS apps—two of them sketching and drawing-related. Adobe Sketch and Line may have been conceived as vehicles for the company’s Ink and Slide stylus and ruler, but the apps easily stand on their own as fantastic applications for drawing and drafting enthusiasts. Both apps are compatible with the fourth-generation iPad or later and first-generation iPad mini or later. The first of the two apps, Adobe Sketch, is a beautifully-constructed app that often-times looks like Paper’s minimalistic, unskeuomorphic cousin. There are five tools available at your disposal: pencil, pen, ink, marker, and an eraser. Next to those tools is a color picker, where you can choose a color theme, pick from the color wheel, check your color history, or pull a color theme from an uploaded image. 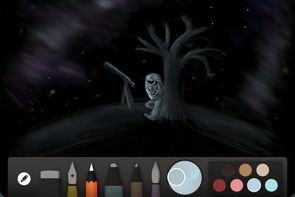 Sketch reminds me of a cleaner, more Adobe-ified version of FiftyThree's Paper app. Sketch and Line both offer great Multi-Touch gestures for undo, redo, scrubbing, and panning; they’re not quite what you may have used in previous drawing programs, but Adobe offers quick video tutorials in the app to get you comfortable. You can swipe two fingers to the left or right to undo or redo; use three fingers along the bottom of the screen to scrub through your history; and a use two finger tap and hold to pan and zoom around your canvas. One word of warning: If you’re using the Ink stylus and enable palm rejection, these gestures become rather difficult to perform. There are several video tutorials on Sketch and Line's Multi-Touch gestures. Of course, Sketch’s big draw (no pun intended) is its pairing with Adobe’s new Ink and Slide stylus tools. And the pairing is seamless—much like Paper, all you have to do is tap the stylus nib to the Connection Center screen to connect your device. Once you do that, you can customize your stylus’s colored top and see its battery life, right from the app. Adobe’s Slide ruler doesn’t have an official pairing ritual, but instead seems to magically pair and unpair with the device whenever it’s touching or removed from the iPad screen. Touch Slide lets you add straight lines in your Sketch compositions. For those without access to Adobe’s new hardware, Sketch also offers a digital companion in the form of Touch Slide. There are two blue touch targets to move the virtual ruler in any direction; once you’re happy with the ruler’s positioning, just draw along the ruler edge with your other hand. It works really well, and it’s a powerful addition for people who want to draw straight lines in their compositions. While Sketch is a solid program in its own right, Line is an outright masterwork from Adobe: an easy-to-use app with incredible power behind it. At its heart, the app is designed to help you easily draft and draw shapes, lines, and other geometrical objects. It does so with a wide array of guides (called Trace Packs and Stamp Packs) that you can enlarge, resize, and twist on your canvas. There are many tools you can use to draw your lines and figures. Like Sketch, Line has a variety of tools you can use to trace these objects, all named for various real-world objects. There’s a 2H pencil, HB pencil, .25MM pen, .50MM pen, brush, marker, and eraser; all of which can be laid down in a variety of colors. And oh, the things you can trace. Lines, shapes, French curves, ellipses, rectangles, triangles, polgyons, Herman Miller chairs—the possibilities are enormous. Line offers a lengthy list of shapes, stamps, lines, and more to add to your canvas. Tracing is made possible with the Touch Slide or physical Slide ruler, depending on what you have access to. As mentioned above, the Touch Slide works by using two fingers to move the virtual ruler around; moving the actual Slide tool around performs the same trick. As you move, you’ll either have the option to draw a line along the ruler’s path or see a greyed shape hovering above the ruler, giving you an idea of where your stamp or circle will land. The canvas also offers snapping and guide lines, and—even cooler—a full perspective view to help you with vanishing points, grid work, and more. Turn on perspective view to help you create a proper landscape. And, of course, like Sketch, you can share all of your Line documents on Behance or export them to Creative Cloud, where you can move them to your desktop to further tweak and improve. Adobe has released two excellent free apps (they require an Adobe ID but no paid Creative Cloud subscription) for artists, sketchers, doodlers, stampers, and all-around creative folk. Between these two, Adobe Photoshop Mix, and the recently-released Adobe Voice, the company’s suite of free iOS apps and its Creative Cloud mission is starting to look more compelling every day. 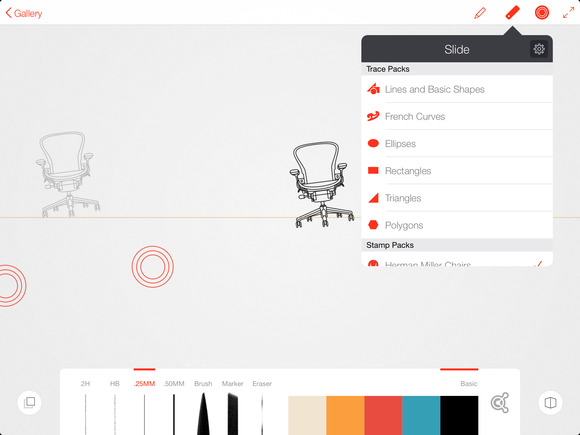 A full-featured drafting program with room for fun, Line is a masterwork from the folks at Adobe. Sketch is a solid drawing program that echoes the best of FiftyThree's Paper and offers excellent Creative Cloud integration.